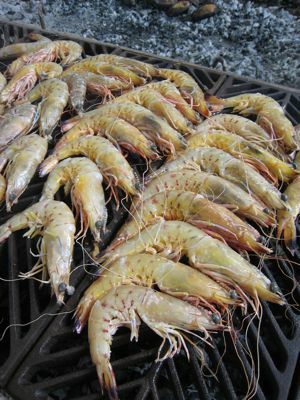 These are medium to large sea caught prawns/shrimps. I try to get “wild” sea prawns/shrimps, as opposed to fishpond raised prawns, whenever possible because they seem to have more “character.” Does that make any sense? Could I really tell a cooked fishpond raised prawn from its wild cousin if I were blindfolded? Maybe not. But the romance of eating a prawn that was free to roam the deep sea, constantly darting its bulging eyes, on the lookout for large predators like fish or giant turtles, somehow appeals to me. And yet, I am the ultimate predator by being the one who does in fact munch on the prawns. 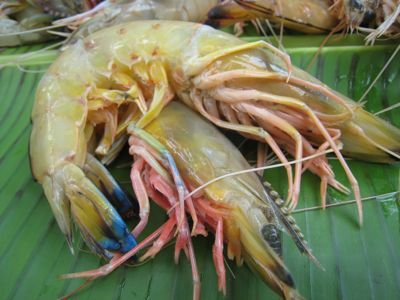 Prawns caught in the open sea seem to possess a lighter, more natural color (unlike the black tiger prawns raised in ponds that are uniformly grey-black), and they sometimes have vivid, shades of blue and orange on some parts of their body. Making sure not to overcook the prawns, we pulled them off the fire after cooking just a few minutes on each side. A little bit of this sawsawan or dip with vinegar, soy sauce, chillies, onions and tomatoes and we were in sea prawn heaven! Also, notice how the shells of the prawns don’t seem to turn that bright orange which many of the darker pond raised prawns have a tendency to do… Next up, the alimasag from the same lunch! Yum. Hello, MM! I like this kind of prawn, too! I find them tastier from the tiger prawns that I usually see in the market. 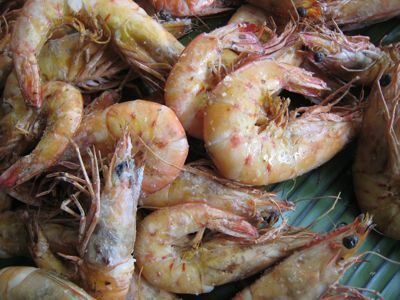 But, instead of grilling it, I use these prawns for sinigang…really delicious! Yummy! You’re right MM,I love sea prawns/shrimps better than tiger black prawns—it’s more tender and flavorful—taste of the sea! Have a question though Market Man, was the skin a little bit rougher on both its head and tail? I noticed the skin has a grain-like texture for the shirmps that I bought, which are very similar to these ones. Free range prawns! When you see them under water, some of them have gorgeous blue/purple spots. I always enjoy spotting them in a crevice, some of them tiny, but with gorgeous spots and streaks on their shells. Beautiful looking prawns! I’d love to use them for my sinigang! oh my. i love to be on that superb lunch! Oh man. These look so good. And don’t even get me started on the sawsawan! And I thought those prawns were enough! You had alimasag? What a wonderful wonderful party that was! Lechon, prawns, and alimasag! MM, I’m just wondering if you grilled the shrimp does it still have the “juice” that comes out of the head? I dont know for others but I like eating my shrimp with sucking the juice out of the head first before I eat the meat. What a bunch of VERY LUCKY employees. Bless your heart MM! MM… Are these green tiger prawns? Bulik? if they taste the same, you must have a very high quality of farm raised prawns/shrimps there and i assume they were never frozen. in some places, questionable farming practice (though not illegal) make a big difference. for the less fortunate me, i have to rely and trust the labeling of previously frozen prawns and shrimps to enjoy a bowl of sinigang. the finished product with the sauce looks so yummy! btw, whats the logic behind the color? how come pond raised shrimp turn bright orange while these look pale when cooked? kate, I am not sure what the real scientific explanation is, if any, it’s just been my personal observation that the shrimps and prawns from the sea tend to have lighter shells/colors. As for the bright tinges of color on sea prawns, I think that is evolutionary camouflage. For the pond raised prawns, it could just be the species, e.g., black tiger prawns, and they might also be affected by the “tight” conditions of a fish pond… but I don’t know that any of that is factually correct. lucadong, yes, the farmed prawns here that I purchase are still alive. Also, we used to have prawn farms and the harvests we got tasted pretty good… inked chef, I don’t think they are tiger prawns, not black or grey ones at least, but rather sea caught prawns. natie, with all this cholesterol and high-uric acid, we might indeed need a company nurse in the years ahead :) Thel, about 20 or us at the office enjoyed this birthday feast, and that didn’t include Artisan and family as well. Everyone from mason to office manager helped prepare and cook, as well as eat all of the goodies. Ejit, yes, if you don’t overcook the shrimp they still had the head juice. Rico, with the lechonan and grill stoked with nearly 2 sacks of charcoal, we kept coming up with ideas for what else to grill that day! Mila, I like that. Will start referring to them as free-range prawns from now on. Alexena, yes, the heads do seem rougher and sharper, maybe because they are in the wild. And they tend to be more muscular, more “busok” due to conditions in the sea. 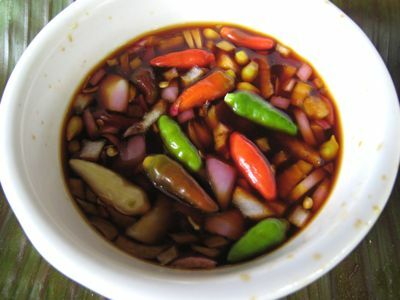 I have to try these in sinigang soon! Like the comments above, I suspect too that the coloration (and flavor) is most likely a function of the particular variety, its habitat and the diet available in that habitat. My town folks showed no preference between cultured and wild prawns and being knowledgeable seafarers, they can (and usually do) draw fine points in these matters. Mother could not tell just by looking or tasting of the prawns themselves though she could tell by whom she bought them from. While eating, she simply had to eye me. I use to suddenly break out in a dramatic transformation thatâ€™s not too far from a chameleon or an octopus shifting camouflage right after eating wild prawns. what’s the difference anyway? this question has bothered me for years! most people say its just size. so how do you distinguish big and small? Umm, hindi makapasok ang earlier comments ko ah. Anyway, here in Houston, most Vietnamese market sells previously frozen shrimp, ok pa rin and I try to buy the ones that looks fresher (yung medio pinkist pa at walang itim-itim on the heads). But at some American groceries, ang tinitinda naman eh “still” frozen shrimps which is cheaper. Some fish mongers told me that those frozen ones are better, kasi they came straight from the boat, also they are less handled (meaning hindi pa masyadong na-huhugasan ng maraming kamay). Kaya yun ang binibili ko whenever they have it available. Same daw with the headless shrimp, sa sobrang linis sa pag-tatanggal ng ulo eh halos wala ng lasa yung hipon, so I buy the ones with the head. By the way, my maiden’s name is Banagan – in English alam mo ba yon Mr. MM? Hahaha, ikaw naman ang pag-iisipin ko. Your turn. tell me again, what is the difference between prawns and shrimps and don’t say price! FRESH SHRIMPS ARE ONE OF MY FAVORITES TO COOK. JUST SEASON LIBERALLY WITH SEA SALT, PUT IN THE POT, COVER AND AFTER 15 TO 20 MINUTES…YOU HAVE THE MOST DELICIOUS SHRIMPS! PREPARE YOUR SAWSAWAN AND YOU’RE IN SHRIMP HEAVEN! Alilay…ummm.. meron pang ibang translation ang Banagan? Yikes, iba ang sa akin eh. Starts with T, and yeap end in R. Pero 2-words siya. 2nd word is pretty much ordinary term. Alilay, sabi ng sister ko pareho daw tayong tama. It depends daw from which province one came from. She Wikie’d the info. How do you cook prawn on butter and garlic? 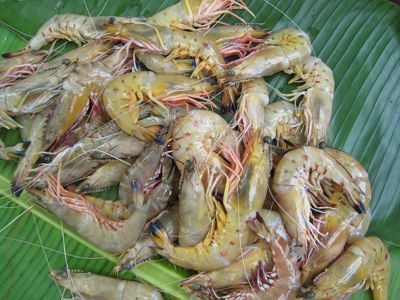 i want to buy frozen prawns in 500g, 800g and 1kg for birmingham, uk if you have the product please email me at cpagba1@yahoo.com for arrangement. Interested to buy in bulk….